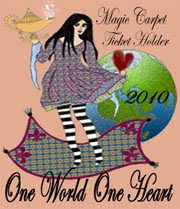 One World One Heart is the brainchild of A Whimsical Bohemian. The idea is to bring blogger's together, and maybe find a kindred spirit or two, or three. I was part of OWOH last year too, at the time I was brand new to blogging, by new I mean I had only been doing it for like 2 or 3 days...seriously. I found quite a few blogs during that event that I still follow. I could have sworn though that this one didn't start until the 28th, so I am running fast to catch up to the magic carpet...wait for me!!!!! This year my giveaway is going to be one of my shaded path prints. For every 100 people that enter I will add another print. If you are so inclined you can pick a different print from my Etsy shop, but this is not about sending people to my shop, it's about blogging, so if ya don't wanna ya don't hafta! Just leave a comment on this post =) easy as pie. Be sure that I have some way to contact you if you win. Winners will be announced on the 15th of February. Anyone who has a blog is welcome to enter. Last time I checked there were 500+ taking part in this event and I'm sure many more to join. If you would like to check out some of the other blogs taking part, click HERE. And thank you for taking the time to visit my OWOH blog yesterday! Thanks for stopping by and entering my giveaway. Please enter me in your drawing for that beautiful print. I'm loving my visit to your blog, and am sure I'll be back soon for another look. Your prints are just fabulous, who wouldn't want one them hanging in their home. Another great blog on the magical carpet ride, I'm so glad I took the ride. What a lovely blog. Your art is magnificent. Oh my goodness it has been such a pleasure to visit your beautiful blog and the artwork you are gifting is so beautiful! Thank you for a magical carpet ride! I am now a follower and a fan! Beautiful print! Please throw my name into the hat! Wonderful work! I am loving this, it's like being on a trip all around the world! Please include me and visit my little piece of blog if you like! Hop on the Magic Carpet and fly over to my blog to enter for my prize. Isn't this fun! What a fabulous giveaway. Please enter me, thank you. Beautiful... what a wonderful print. thanks for sharing! throw me into the hat, I can see this on my wall! My daughter just went "WOW" when she saw your print. We both think you are pretty good. Count me in. It is so delightful to find new blogs on this Magic Carpet Ride. I hope you are having as much fun as I am in my travels. Please enter my name in your giveaway and stop by (#52) to enter my beaded bracelet giveaway. I think your artwork is lovely. I would be thrilled to own one! Oh, I love that print! And would love a chance at it. I've done OWOH for several years but just couldn't squeeze in time to put up a blog, much less VISIT everyone this year. Sigh. Your painting is just beautiful! You're very talented!! Please do fly over to my blog if you can, to see my giveaway! Love the print. Wonder what adventure the path would lead to? Would love to have this in my studio. What an awesome giveaway ! Please count me in, and do pop by my blog as well on your journey on the magic carpet around the world ! I am no 451 in this OWOH event. This print is truly wonderful! It takes me away even if only for the moment! Thanks for including me in your giveaway! Greetings from Maine. Oh I have to win that print, it is gorgeous, simply gorgeous. Please sign me up. Thanks. Hopping from the bottom up today to give some love to the new arrivals. Wonderful giveaway that I would love to have; your work is fantastic! Please enter me! PS I'll be out of the country and away from the internet from the 14th-20th. If I am lucky enough to win, PLEASE hold that prize for me until I return to claim it!!! LOL! Hello Lynn! What a pleasure it is to meet you. This piece is so incredibly lovely!!!! There is much to be said about trees. You are offering such a beautiful gift. I hope that you shall come and visit with me and travel on my Magic Carpet! Your print is lovely. Please include me in your in your drawing. Wonderful print! Pls count me in and thank you for the chance to win! I love your tree tunnel painting. Please enter me in the draw. Thank you and have a lovely day. I love those paths that lead into the unknown...Great art work...Happy OWOH..
What a lovely print! I'd love a chance to win! That print is beautiful! So dreamy, like a journey waiting to be taken. Beautiful print~ I LOVE it!!! so glad my carpet stopped here! delightful print! please stop by & chat if you're in my neighborhood! Lynn...thank you for stopping by my blog to enter to win one of my OWOH art-glass heart pendants! Good luck! Your shaded path print is just wonderful, but I couldn't help but check out your Etsy shop... all of your prints are really really nice! I'd love to be entered into your drawing! Thank you! What a wonderful giveaway and such a treat visiting your blog. Be sure to stop by (#633) to sign up for my giveaway! I absolutely love trees of all kinds....and would love this for my wall! I would soooo LOVE to have this print! It is a jaw-dropper!I already know exactly where I would hang it! I have a friend that makes extra special frames so it would have to make a trip there first! WOW!!!!! This is totally stunning, your work is gorgeous. I love your blog, awesome. Would love to be added for your giveaway. I love the opportunity this contest gives me to discover new blogs like yours! Love your prints! Love your print! Reminds me of a C.S. Lewis story. Hi Lynn! I remember you from last year because I fell in love with your wonderful hair clips.. I saved your blog in my favorites so that I could buy one when my hair was finally long enough (it's almost there!) but when I clicked the link a few months ago the blog was gone. Your art is definitely your own personal signature though because as soon as I saw the painting I knew it had to be you! I checked your etsy shop and, sure enough, the barrettes I love are right there, and they are even prettier this year. I'm so glad you joined OWOH again. Come visit me at www.taffetamoon.com for a chance to win a suncatcher. i know exactly where this would go in my home! Your print is fantastic. I feel as if I could take a walk between those rows of trees. Your work is so lovely! I really, really like this print! Hope I win! What a lovely work of art, it would look so nice in my home!!! Please add me to the list. Thank you for a lovely stop on my magic carpet ride! That's a beautiful painting! I've never heard of this event, but it sounds really great. Oh that is just beautiful! !What lovely artwork you do!! Please add me to you list!! your artwork is beautiful. I would love to hang it in my home. I really like the light at the end of the tunnel theme of this print, and I love the green. Very nice work! Such a lovely give-a-way...It's been a great carpet ride visiting the many participants this year. Thank you for making my journey a great one! gorgeous! thanks for your generosity! Your work is nothing if not enchanting. Thank you so much for your generosity and for being included in the giveaway! Fabulous art! Come visit my blog for a giveaway prize, too. Oh my goodness, your "shaded path" print is gorgeous! Please enter my name into your fabulous drawing for a chance to win. what a dreamy print! I love it! I want it! This piece just draws the viewer into it. It is serene and slightly mysterious all at once. Thank you for the opportunity to win a print of it. What a great give away, I would love to win, please count me in. I love your Shaded Path print - it can be interpreted so many different ways! Count me in! Lynn, your prints are stunning! You are very talented :o) Please enter my name and thank you. I LOVE that print...it would look so special in my kitchen! Thanks for the chance to win it. And when you have time stop by mine and enter. Love your art!!! I would love to be the winner! Please include me and come enter my giveaway too! That is a lovely giveaway. Please enter me into your giveaway and thank you for the opportunity. I absolutely love this!!!!! It is beautiful to my eye. Please count me in. Hi Lynn, what a lovely idea and post you have. I love the gorgeous print. I'd love to win. I absolutely love your gifts. Please take time to visit my blog, too, for a chance to win my book, 16 x MOM: A Mastery of Motherhood. I'm working on getting all the country flags. I promise to revisit your's too. what a great giveaway.lovely art work! thanks so much for the opportunity to enter the drawing. so delighted to meet you through this event. I hope you'll stop by my blog as well. What a gorgeous print - it would be a fantastic complement to my Magician's Rod photograph. Thanks for visiting me at Around the Island and entering my photography giveaway as well. What a gorgeous print! Love your artwork! I have the perfect place for this if I am lucky enough to win! What a beautiful giveaway, right out of gone with the wind - lol... please enter me for a chance to win and stop by #234 on the magic carpet when you get a chance. What a wonderful giveaway! Drop by my blog at #968. Shaded paths sound heavenly to me. I'd love this on my wall. Please enter me in your draw. What a stunning print. Please count me in. I like this one fine! You've captured an idyllic place; here's to all of us having such a world inside our head. Wonderful print, I would love to win it. I love trees, there's just something magical about them. I also love the tree you have in your etsy shop. Thanks for the opportunity to win a piece of your art. Hi from Pennsylvania. Your work is exquisite! Thanks for offering one of your creations. Lovely! Reminds me of a place in Florida I visited with my husband's grandmother many many years ago. carpet to win a designer Cath Kidston bag, handmade by me! Beautiful prints- I looked at etsy too but i like the one you picked out. Please add my name to your generous giveaway and I hope you area having as much fun as I am, hopping from blog to blog, checking out all these creative people. p.s. - please come & visit # 1031, thanks!! Love the print and love the gothic crow print too! Please enter me! What a gorgeous print! Please count me in! Just beautiful, please count me in. I would love to be included in your drawing. Your paintings are lovely. I do like shaded path but also big chill. Your paintings are just fabulous! How beautiful! I'm so yearning for green trees right now too! Please enter me for your draw, I would love to be included. Thank you so much for entering my giveaway as well. your work is beautiful! I'd love to have a print of yours. What an awesome and creative giveaway! I would love to be a lucky winner in this! I am #926 & #927 on OWOH! Please enter me in your giveaway. I love your print, shaded pathways are one of my favourite subjects. Your picture is heavenly! Please enter me in your giveaway, and don't forget to fly my way (#922)! I would love to have one of your prints to admire in my home. Your giveaway is terrific! I would love a chance to win. Please add my name to your drawing! Thanks for participating in the OWOH event. What a lovely work of art! Please count me in. Oh, I love your print....great giveaway. I would love a chance to win! beautiful print! please enter me in your drawing! Thank you so much for the great giveaway. The print is gorgeous. Please enter me in the drawing and be sure to come by mine at #99 if you haven't had a chance yet. I enjoyed visiting your blog. Your painting is wonderful. It leads me to continue on this journey. Please include me in your drawing. This print is just beautiful...it reminds me of our driveway in the backwoods of Tennesee where I grew up as a child!! I would love to win, please enter my name into your drawing! And if you haven't already, please enter mine #135 to win 1 of 3 prizes!!! Lovely blog! Wonderful giveaway! Come and see me too! I love your print! Please count me in! Keeping my fingers and toes crossed here in snowy Virginia! 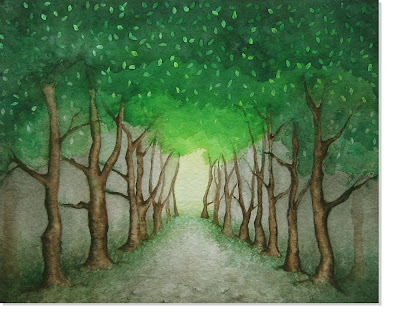 Enchanting Shaded Path Print OWOH Giveaway! oooh that is so gorgeous. It looks like the canopy roads we have here in the deep south!! Very nice! !